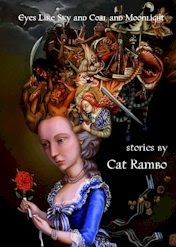 My story recommendation for this week is "Her Eyes Like Sky, and Coal, and Moonlight" by Cat Rambo, the (almost) title story of Rambo's new collection Eyes Like Sky and Coal and Moonlight, from small publisher Paper Golem, with gorgeous cover art by Carrie Ann Baade. "Her Eyes Like Sky, and Coal, and Moonlight" is a beautifully constructed story, telling in hindsight of the battles for control of a war-torn kingdom, as glimpsed from the point of view of a young (at first) woman whose family's inn is an occasional meeting place of a group of rebels. The rebels include the enigmatic sorceress whose haunting eyes lend the story its poetic title. The rebels' struggle defines our narrator's life, even though she sees almost none of the action take place. The danger in such a story is the reader may feel disappointed that the most interesting events are occurring offstage, but Rambo tells it in a way that suggests this is the real story, that the battles of great kings and warriors and wizards are important only for how they affect the lives of common folk. "Her Eyes Like Sky, and Coal, and Moonlight" is quite short, like most of Cat Rambo's work -- only a few of the stories in Eyes Like Sky and Coal and Moonlight are over ten pages and none over twenty. Usually it is difficult to create a compelling tale in so few words, but Rambo is superb at providing a sense of depth, making you feel there is more to the story and characters, that you could fill in much of the rest of the story yourself from the hints she drops. I'll try to get a review of the whole book up at Fantastic Reviews before too long, but for now I'll just say that Eyes Like Sky and Coal and Moonlight is an excellent collection by a most elegant writer.